Everyone have their own ways of setting up service accounts. Technically its possible to run every SharePoint service under ONE account, lets follow the least privilege principle best practice. When you are running with multiple SharePoint 2013 environments like Dev, Test and Production (Best Practice!) you can explicitly segregate the service accounts in their names. Such as: SP13_PROD_Setup. Local Administrator on all the SharePoint Servers. SecurityAdmin and DBCreator Server Roles. It needs DBO access on Content databases to run PowerShell, Which should be added later (Add-SPShellAdmin). - Application pool identity for the SharePoint central Administration Web site. Permissions are automatically granted to the farm account on running Config wizard. Account needs to be in the local administrators group at the time of User Profile Provisioning! Read-only Access on all external sites. The account used to Import user profile and provides synchronization between SharePoint and AD. Replicate Directory Changes permission on the domain. After setting up the managed accounts, you can start assigning to some services. 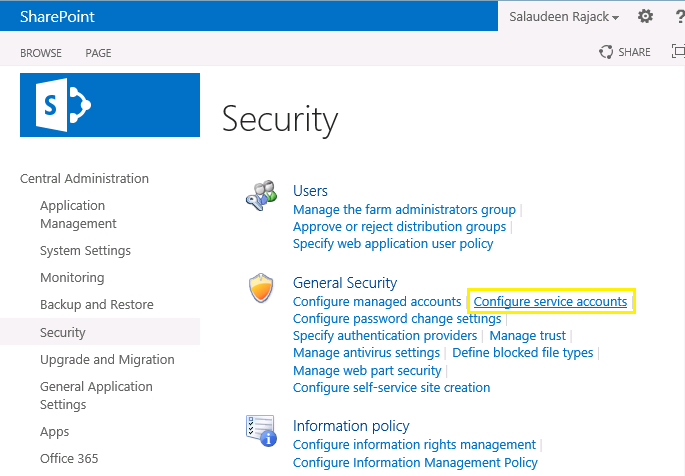 Go to Central Administration >> Security >> Configure service accounts page to associate service accounts with SharePoint services, such as "Farm account". Important: All accounts must be a domain accounts! 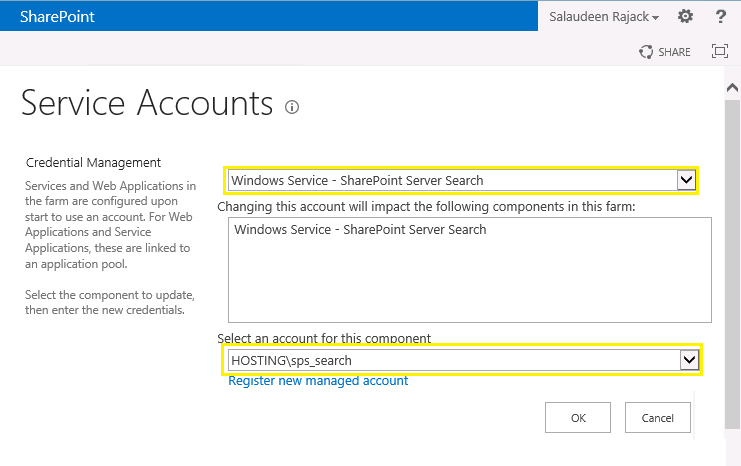 No local account can be used as SharePoint service account. Depending on your organization's security policies, you may have to add/remove service accounts to this list. You may consider additional Service Application for services such as Excel Unattended Service, Visio, etc.